English rabbi; born in London May 28, 1848; educated at Jews' College in that city. He was appointed rabbi of the North London Synagogue in 1868, and in 1874 went to the Old Hebrew Congregation of Liverpool, where he officiated as preacher until 1882. He became delegate senior minister of the West London Synagogue in 1893, when Professor Marks retired from active service. 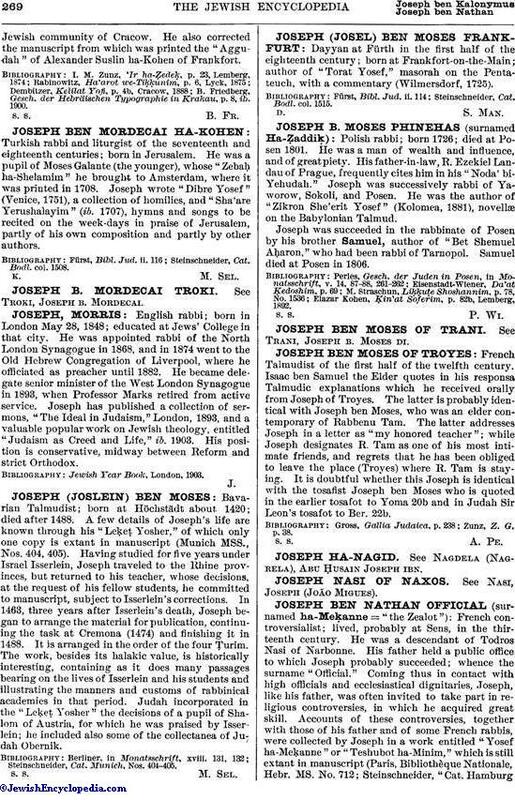 Joseph has published a collection of sermons, "The Ideal in Judaism," London, 1893, and a valuable popular work on Jewish theology, entitled "Judaism as Creed and Life," ib. 1903. His position is conservative, midway between Reform and strict Orthodox. Jewish Year Book, London, 1903.